Thinking of updating your office interior in 2018? When you’re spending 8 hours a day and often more at work, you can easily tire of the office interiors. Its been proven that morale and productivity suffer in an uninspiring environment, so a change of scenery could be just what everyone needs. With a wealth of knowledge, inspiration and shared experiences available online, there’s no need to re-invent the wheel. Have a look at Pinterest and Instagram for some ideas. Creating a grand vision of what the office could look like once renovations are finished is important, but staying within your budget is important too. Make sure you set a budget before you start. Your employees know the layout and the flow of the space, and (most likely) have thoughts about elements they would change if they were in charge of the design. Talk to them about what your goals are for a renovation, gather their suggestions, and find a way to incorporate their ideas into the design. They will have some suggestions for optimising your space based on work they have done in the past, too. There are various elements of an office interior which can each be changed, sometimes just changing one of these, such as office flooring or furniture can transform an office. Office flooring is key in providing the first impression when someone enters your office. Your office floor is one place that is accessed more than any other area in your office. Though you might be cleaning your office carpet on a regular basis, the constant walking over it will make your office carpet look faded and worn. A new carpet in a striking colour or different flooring materials used to zone an office work well. With some decorating and interior design, you can have that colourful, vibrant office you've always dreamt of. Office walls can be jazzed up with bespoke digital wallpaper, designed to portray your brand or given a fresh coat of paint with colours chosen to create the right environment. Certain colours are known to lift the mood such as bright shades like yellow, red and orange. The colour orange stimulates mental activity by increasing the supply of oxygen to the brain and makes you feel invigorated and ready to get things done. You may consider using a professional office design service which will take into consideration your company size, future goals, workflow and flexible working. 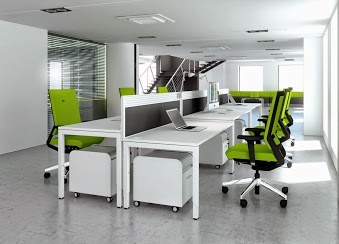 An ergonomically designed office is going to boost productivity among your employees. There’s some great looking office furniture available. Don’t underestimate the impact of having a better desk and nicer, more comfortable chair. Gone are the days of offices chairs reflecting pecking order in a company, with the office junior getting stuck with the one that doesn’t adjust properly. Bad posture can lead to pain in the neck, back, shoulders, legs and feet, as well as referred pain in the head. It can add to stress and fatigue and in the long term, it can cause serious musculoskeletal disorders. Everyone should have adjustable chairs and desks to ensure that the height is suited for your employees’ unique requirements. You can also utilise sit and stand desks to give people the option of how they prefer to work. More tips for adopting good posture at work can be found here. There’s no need to worry about disruption to your working day. We regularly refit occupied offices, often working on weekends to ensure that any disruption is kept to a minimum, with no sacrifice to our quality of finish. You could come into work on a Monday morning to a bright new office interior – could be just what your team needs for boosting #MondayMotivation.